This listing is for one hiqh quality JPEG file of a Pink Zebra Thank You Note. 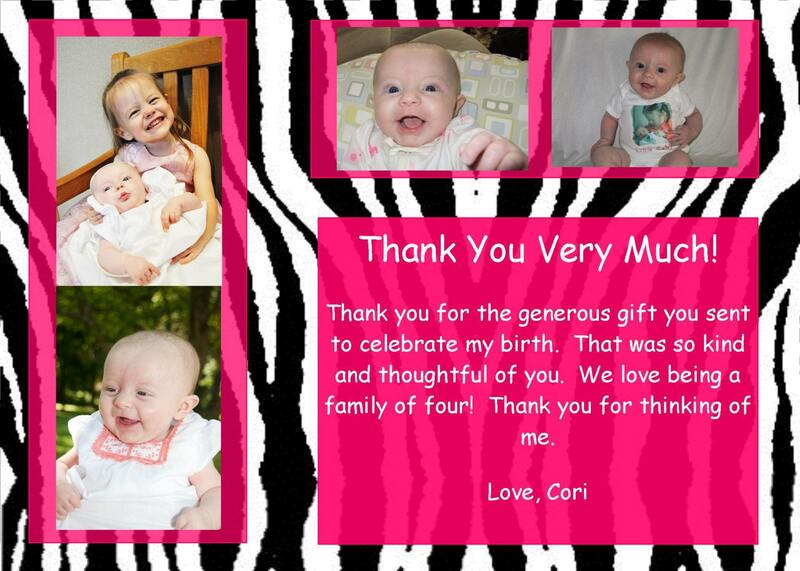 The Thank you note coordinates with the Zebra Baby Shower Invitation, but could be modified to be birth announcements, baby thank yous, or general birthday thank you note. With this file you can print as many thank you notes as you'd like - or email it to all your guests to save money on postage. Fonts, Font Colors, and Text Box Colors can be changed, along with all wording. I will email you the first proof of your invitation within 24 hours of receiving your photo and we'll work together until you are fully satisfied with the final product. For an additional $5.00, I can personalize each of the Thank You Notes for your guests, for up to 15 thank you notes. For example, instead of a generic saying "Thank you for sharing in the celebration of my 3rd birthday. Your wonderful gift was very kind and generous and I love it. Love, Anna" We can personalize each card "Dear Aunt Mary and Uncle Mark, Thank you for the Toy Story beach towel and Cars 2 Book. They are my favorites. I can't wait to go to swimming lessons and use my new towel! It was so great to see you. Thank you for helping me celebrate my third birthday. Love, Anna" All you have to do is type either the guests/gifts in an email to me, or you can type out what you want each note to say and then each guest gets a personalized thank you. It's a nice touch and your guests will be wow'd and appreciate your time and thoughfulness. To add this level of personalization, please contact me for a custom listing. Thank you for looking and I hope to work with you to create the card of your dreams!